I was perusing the pbkids website the other morning - I know. It's a disease. It's really their fault because they keep sending all these emails. 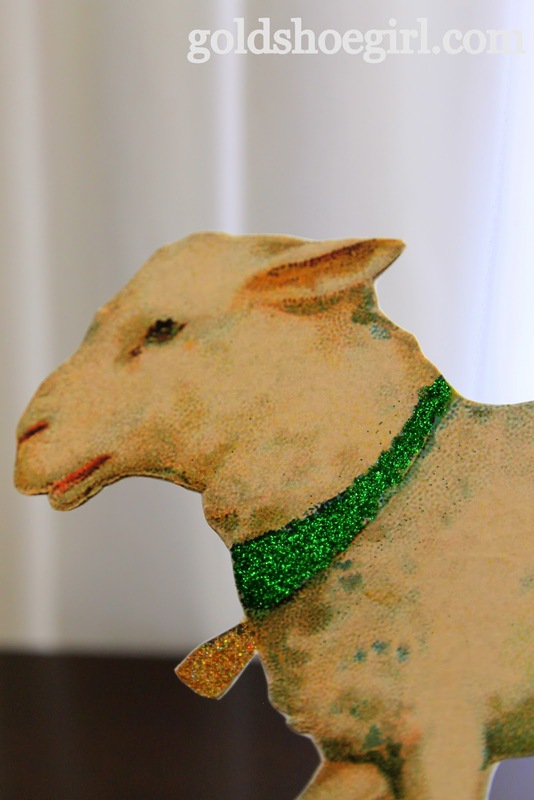 Anyways, they have these really cute Peter Rabbit Glitter Cut-Outs for Easter. They looked so good I almost just ordered them. Almost. Then I decided I could do some myself and probably for a lot less money. I immediately headed over to The Graphics Fairy and found the little lamb. Then I did a google search and found the bunny and the chicks. I printed all 3 onto white card stock using the best quality setting on my printer. After printing I did enhance some of the parts of the bunny with some felt tip markers. Sometimes when you enlarge things in Word the image quality suffers a bit and filling in things with a marker makes a huge difference. I decided to highlight just a small detail on each vintage animal instead of outlining the entire shape in glitter. Now I did have to go buy glitter and I did spend about $10 on glitter but I do now have 15 little jars of glitter to use on any future projects. I may just be glittering up some paper mache eggs this weekend:). Here they are again sitting on top of our piano. 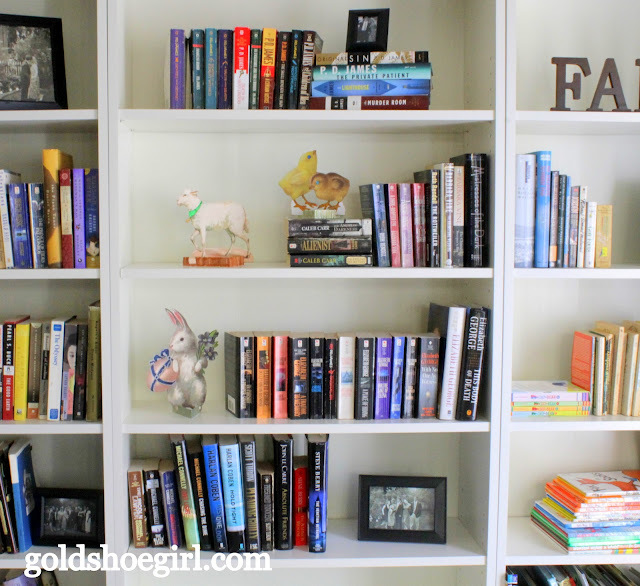 Here they are lounging around in the bookcase. I think I like them here the best. Another spot in the bookcases. 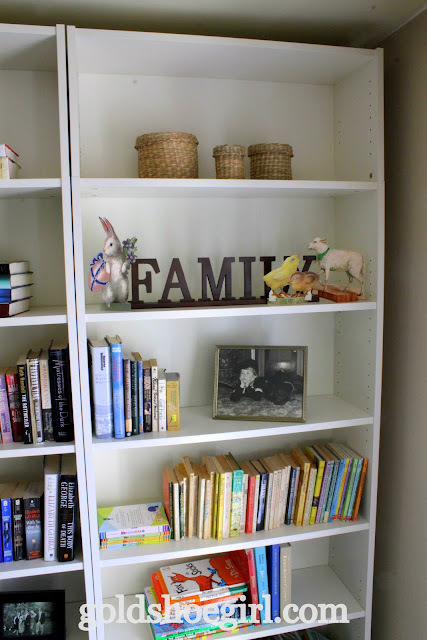 By the way if you want the details on the bookcase project you can click here. 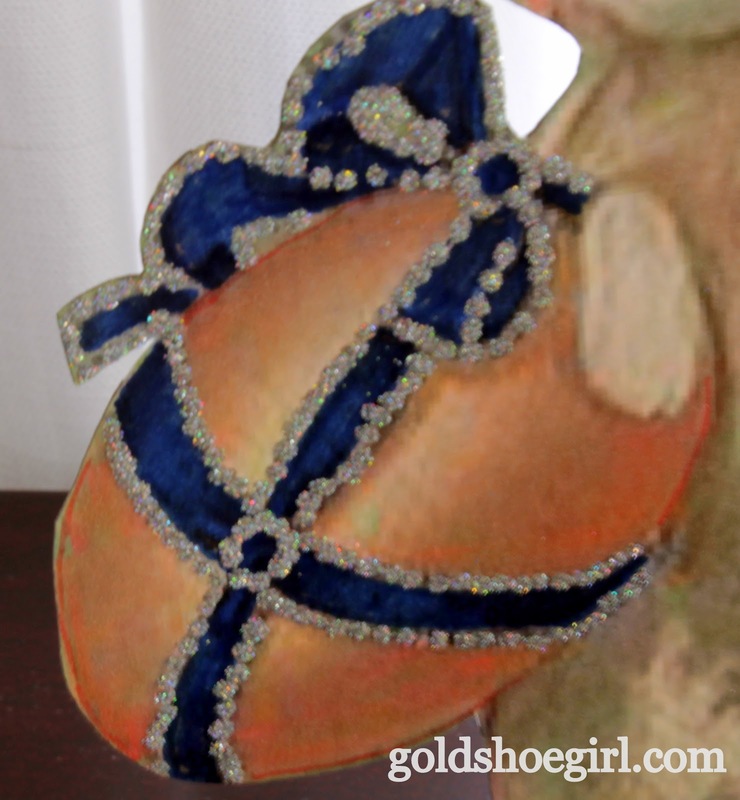 For the bunny I used silver glitter to outline the ribbon on his egg. 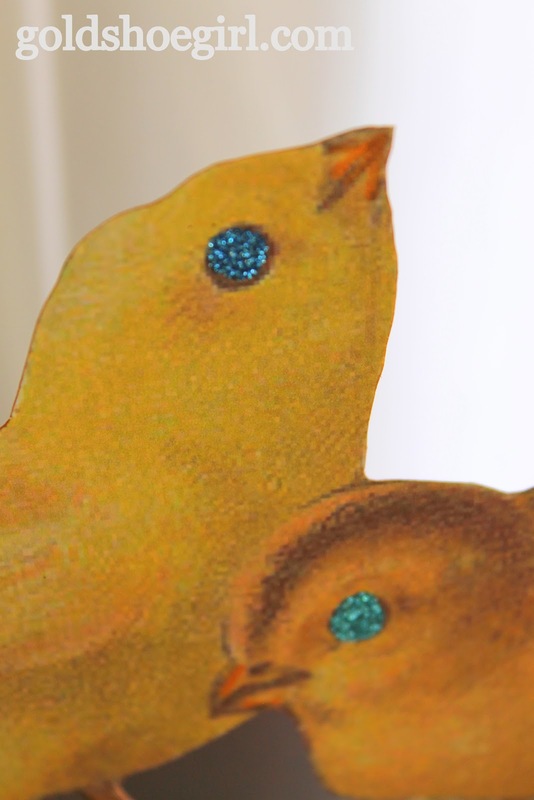 Because the chicks didn't have any accouterments, I thought their eyes were the feature that could use some glitter. The little lamb is my favorite. His bell and collar turned out so nice. My goal with this project was to make a little something that could sit on a shelf or mantle to make it festive for Easter. I love the vintage look of these - as if they could have been in our family for years and perhaps they will be. I am thinking that I could even add some eggs or a basket to fill out the set. Which Easter animal is your favorite? 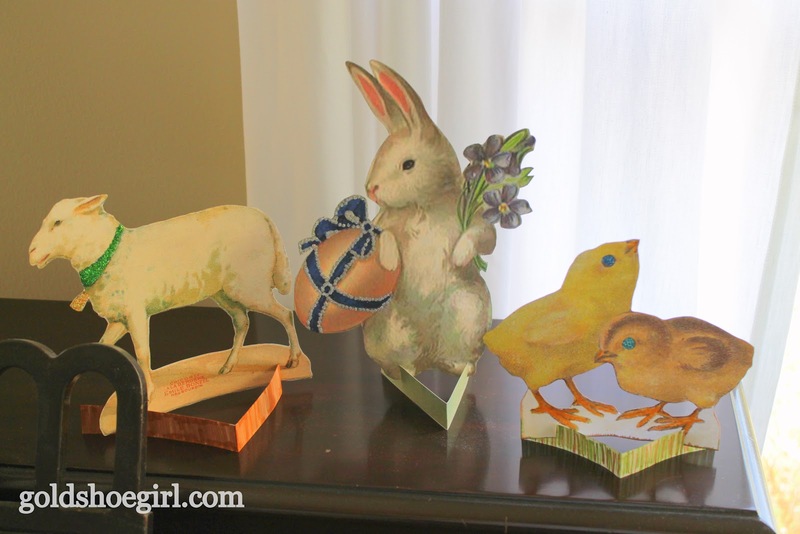 These cutouts are adorable, and they remind me of my childhood Easters. I especially like the little glittered accents. (I'm kind of in love with glitter.) Thanks for sharing these! Thanks! I do love a good mystery as you can see. I just love your Easter cutouts!!! Can you say adorable? I was wondering if you simply used them on cardstock as they came out of the printer or did you month them on soemthing else as well like cardboard or masonite? Hi! They are just plain old cardstock. I will say that if we get a good breeze they go flying over but up in the bookcase they are just fine. These are adorable and very festive! I love the glitter details! I like them better than the ones you were going to buy--even though they are very cute too, these are more Eastery and so colorful. very very cute!! saw this at Brag Monday. :) Simple, and it makes me smile. These are so sweet! I love that you created them to be standup decorations. Oh, these are so darling! I love that little lamb and you've used them so sweetly. 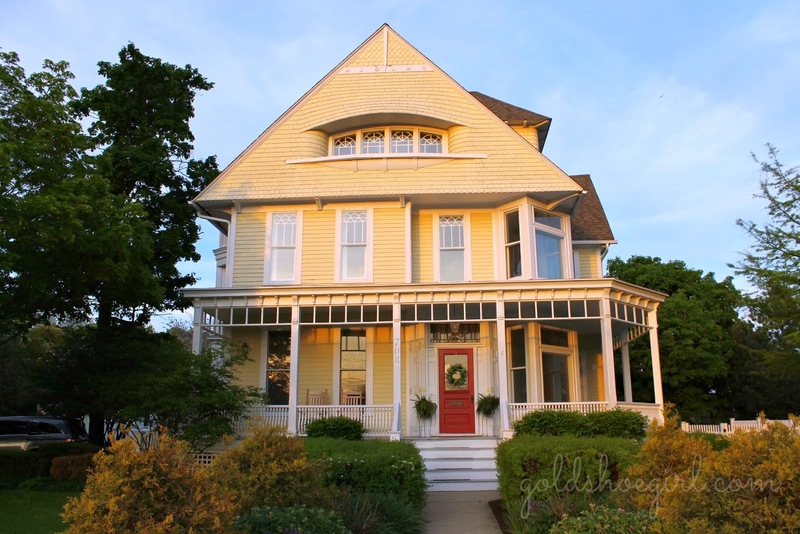 I saw your project on Centsational Girl's party and had to stop by and check them out. Very cute!!! This is just adorable! I was thinking of doing a stand up figure with the same lamb too! Happy Easter! I've totally been eying up the PB Peter Rabbits! I love the lamb...but, I'm partial to the sheepies! They're all pretty terrific!